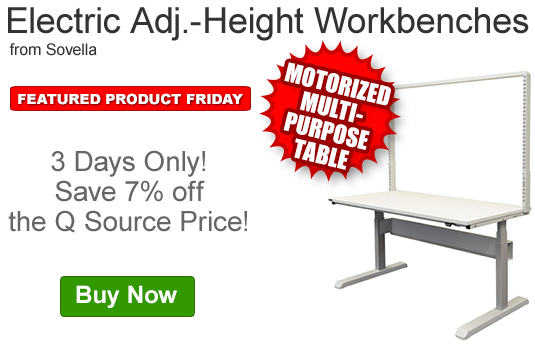 Save an extra 7% off the Q Source price of Sovella’s Electric Adjustable-Height Workbenches. 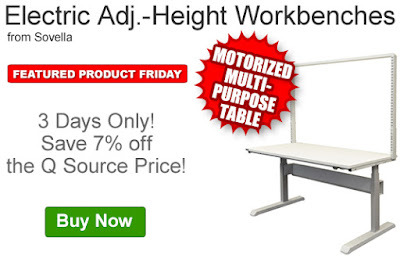 Our FPF100716 Coupon Code is auto applied when you add an eligible workbench to your shopping cart. This Featured Product Friday (FPF) promo is valid from today, October 7, 2016 through Sunday, October 9, 2016 and the code is unlimited use. Sovella’s light-duty, motorized workbenches offer ergonomic versatility for many environments including light industrial, laboratory, light assembly, quality control, packing and technical offices. These adjustable-height models meet ergonomic standards for both seated and standing positions. Click here to shop, or for further questions about Featured Product Friday, please read our informational blog post, call us (800-966-6020), or send us an email. Please note: This promo is valid only at QSource.com and expires on October 9, 2016.